Please note: minimum fee for a party is $195; you can pay this now through Paypal or pay $100 deposit only by direct deposit. Either payment must be paid at time of booking to secure your date. Because our parties and events are all fully hosted, with catering options available, you get a ‘no-mess’ party experience with all the hard work taken care of. 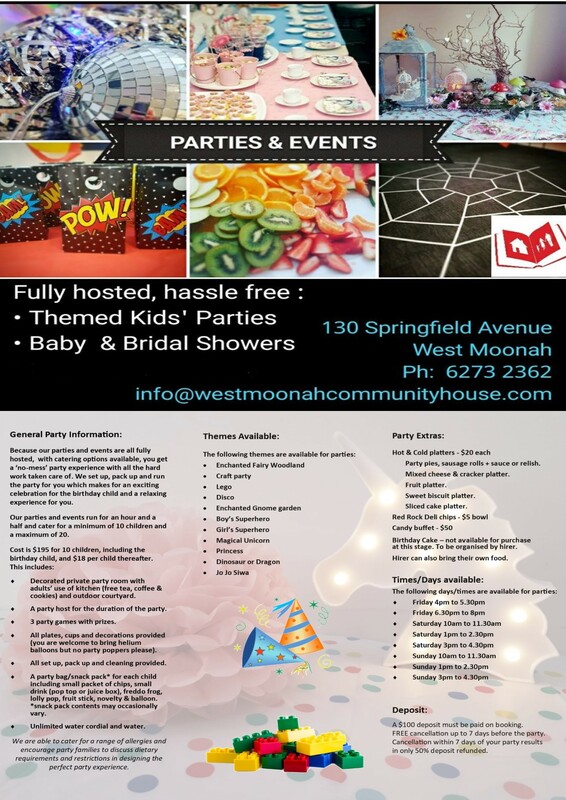 We set up, pack up and run the party for you which makes for an exciting celebration for the birthday child and a relaxing experience for you. Our parties and events run for an hour and a half and cater for a minimum of 10 children and a maximum of 20.
birthday child, and $18 per child thereafter. ¨ Decorated private party room with adults’ use of kitchen (free tea, coffee & cookies) and outdoor courtyard. ¨ A party host for the duration of the party. ¨ 3 party games with prizes. balloons but no party poppers please). ¨ All set up, pack up and cleaning provided. ¨ A party bag/snack pack* for each child including small packet of chips, small drink (pop top or juice box), freddo frog, lolly pop, fruit stick, novelty & balloon. *snack pack contents may occasionally vary. ¨ Unlimited water cordial and water. requirements and restrictions in designing the perfect party experience.